PLEASE NOTE THIS IS A PROFFESIONAL USE ONLY PRODUCT AND WILL REQUIRE A PEST CONTROL LICENCE OR PROOF OF A COMPLIANT FARM ASSURANCE SCHEME IN ORDER TO PURCHASE. PLEASE EMAIL US A COPY TO sales@farm-country.co.uk YOUR ORDER WILL BE PENDING UNTIL WE RECEIVE THIS DOCUMENTATION. IF WE DO NOT RECEIVE THIS WITHIN 30 DAYS THE ORDER WILL BE CANCELLED. Romax Bromadialone Bait. 20Kg. Highly palatable bait for use against rats and mice, indoors and outdoors.Contains 0.005% bromadiolone. For use against rats and mice, indoors and out. Romax Bromadiolone is formulated using high quality food grade whole wheat. Our baits are blended with feeding enhancers and adjuvants to improve palatability and bait take. The dust free, de-husked wheat contains bio-stats that inhibit mould/fungi growth when the bait is used in damp conditions. The whole wheat is also treated to prevent germination which increases the quality life of the product without affecting its palatability. 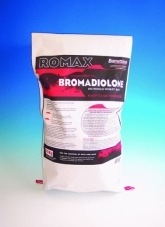 Romax Bromadiolone baits contain the human taste deterrent denatonium benzoate which will deter accidental consumption by children. A dark red dye that acts as a colour warning indicator has also been added which will help identify any handling or attempted consumption of the bait. These additives enhance safety without loss of palatability.